“Down a Dark Hall” (2018, Lionsgate) An arson rap spurs the parents of headstrong teen AnnaSophia Robb to ship her off to the Blackwood Boarding School where, under the tutelage of headmistress Madame Duret (Uma Thurman), they discover and hone previously hidden talents. But as the girls gradually discover, their newfound abilities are due more to sinister and unseen hands than their schooling. Rodrigo Cortes‘ adaptation of Lois Duncan‘s YA novel is long on Gothic atmosphere and production value, and benefits greatly from its cast, all of whom, while capable, are no match for Thurman, whose relish at playing such well-heeled malevolence is palpable; the script can’t tap into Duncan’s ability to craft believable young characters, and as such, takes a back seat to the mechanics (which include an impressive conflagration). Lionsgate’s Blu-ray includes an EPK-styled look at the making of the film, as well as an unfinished deleted scene and trailers. “Dracula A.D. 1972” (1972, Warner Archives Collection) Resurrected by hippie libertines during a Black Mass, Dracula (Christopher Lee) ventures forth into 1970s London to wreak vengeance on Lorrimer Van Helsing (Peter Cushing), a descendant of his old nemesis. 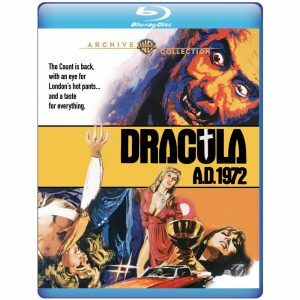 Penultimate Hammer Film to feature Lee and Cushing as Prince of Darkness and Vampire Hunter, and the first to bring the characters into the modern day; the transition is not without its rough patches – the hippie Satanists, which include Caroline Munro among their number, are mostly woeful caricatures, and Don Houghton’s tongue-in-cheek script is loaded with lead – but the Lee/Cushing team rises above any shortcomings, and there’s fine support by Stephanie Beacham as Van Helsing’s granddaughter and Christopher Neame as occult freak turned vampire acolyte Johnny Alucard. The soundtrack, too, is full of crate-digger pleasures, including two tracks and an on-screen appearance by Bay Area act Stoneground (led by former Beau Brummel Sal Valentino) and a score by Mike Vickers (ex-Manfred Mann). Warner Archives’ Blu-ray offers a stellar 2K restoration and the original theatrical trailer. “Absurd” (1981, Severin Films) King-sized lunatic George Eastman, who can regenerate his cells thanks to a joint church-and-science experiment, descends upon a suburban home for a gory game of cat-and-mouse with a disabled girl (Katya Berger, step-daughter of Eurowestern vet William Berger) and her brother. A sequel of sorts to director Joe D’Amato‘s infamous cannibal thriller “Anthropophagus,” “Absurd” takes its cues from American slasher films of the period, with “Halloween” being the most obvious source (Eastman’s indestructibility, Edmund Purdom as an ersatz Dr. Loomis), but jettisons even their bare-bones story structure in favor of a tide of gross-out scenes (characters are dispatched by drill and oven) and jump-out-and-boo shocks. Fans of ’80s Continental horror are unquestionably the core audience for Severin’s lavishly restored Blu-ray, which offers both uncut English-language and shorter Italian version, along with interviews with Eastman (who rewrote the original script), director Michele Soavi (who plays a biker in the film) and a vintage conversation with D’Amato. 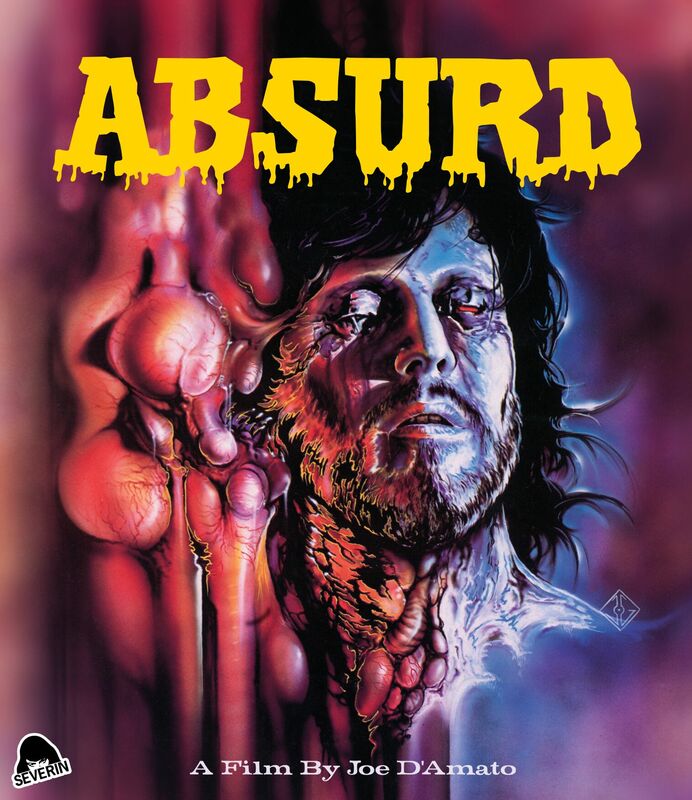 Severin also has a new Blu-ray of “Anthropophagus,” which features Eastman in a more monstrous version of his “Absurd” character and some genuinely unpleasant setpieces that earned it a place on the U.K.’s video nasties list in the 1980s. 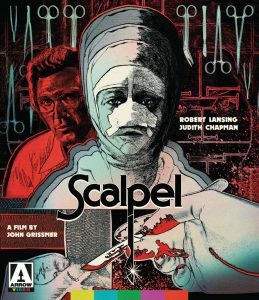 “Scalpel” (1977, Arrow Video) Out-to-lunch medical horror with a stern Robert Lansing as a deranged surgeon who, upon being excised from his father-in-law’s will, decides to circumvent the issue by transforming a badly injured dancer (Judith Chapman) into a lookalike of the estate’s sole heir – a long-missing granddaughter. The scheme goes off the rails in somewhat spectacular fashion – as half-cocked, inherently moral-free plans often do – and if the denouement leaves rationality by the roadside, there is a degree of slow-boiling shivers to be found in the relationship between Lansing and Chapman, which grows incrementally more perverse as the pair embrace their false identities. Obscure ’70s thriller benefits from better-than-average production values – there’s a swell, creepy score by Robert Cobert (“The Night Stalker”), the cast carries the picture over its uneven ground, and the cinematography by Edward Lachman (“Wonderstruck”) has an unsettling patina of saturated decay – all of which are well showcased in Arrow’s Blu-ray presentation. Two versions of the film are included– one featuring Lachman’s color compositions and an alternate take featuring a more mainstream grading – along with interviews with Lachman, Chapman and director John Grissmer, with typically detailed commentary by historian Richard Harland Smith rounding out the disc. This entry was posted in Movies and tagged Arrow Video, Lionsgate, Severin Films, Warner Archives Collection. Bookmark the permalink.